Follow the development, decline and revival of Britain's railways through a unique collection of old and new maps, commentaries and photographs. The story is traced from early `waggonways' through the steam era to today's diesel and electric railways. Railways appear in almost every type of topographical map available throughout the nineteenth and twentieth centuries. Detailed parliamentary plans were drawn up for many hundreds of proposed railway schemes (plenty of which never got past the drawing board). Once built, the Ordnance Survey then plotted the lines onto their map sheets and cartographers, such as John Barthomolew & Son, Cruchley and Bradshaw, were commissioned to draw vast numbers of railway maps during the boom years. Maps were produced as an aid to the management of the railways, to promote the railway companies' networks, and to enable passengers to plan their journeys and understand the passing scene as they gazed from the carriage window. Twenty-four `mileposts' describe the history of the railways. Alongside the maps are a series of `milepost' features which give a detailed description of key events, eras and personalities in the history of Britain's railways. The nineteenth century saw the foundations laid for our modern railway network, with huge building projects constructing thousands of miles of track, bridges, and tunnels. This expansion slowed in the early twentieth century as competition from the car and the lorry began to bite. The railways made an enormous contribution to the World Wars, then underwent massive re-equipment after nationalization, before changing drastically following the infamous `Beeching Report' of 1963. The modern era has seen an expansion of the network again, with the building of the Channel Tunnel and the re-opening of a significant number of lines closed under the 'Beeching axe', many as heritage railways. A beautifully produced book. 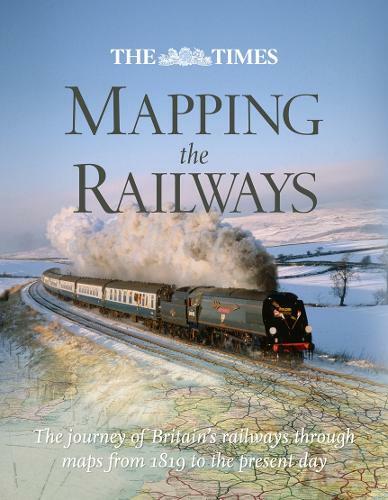 In effect a potted history of railways in the UK with maps illustrating how it changed the landscape.